South East Crete - the eastern region of Crete island in Greece is named Lasithi Λασίθι or Lassithi. 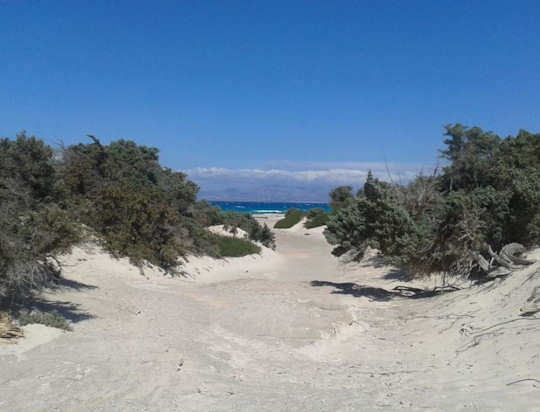 The area is home to hundreds of relatively undeveloped beaches as well as the town of Ierapetra, Chrissi Island and Makrigialos Beach. To get to this region of Crete, you will most likely need to travel through Agios Nikolaos town. This pretty, modern town has a ferry port with ferries arriving from Rhodes and Karpathos via Sitia. The town sits around the lake pictured above, which is linked to the sea port, and surrounded by cafes and tavernas, making a romantic lakeside location for an evening stroll, cocktails and a meal. The town of Ierapetra is located just 36 km from Agios Nikoloas in the south of Lasithi, with access via the major highways and on the local buses. This town is a seaside holiday destination, with fine beaches, a ruined Venetian fort, a wide esplanade, folk museums and seafront tavernas with fresh seafood. This is the departure port for the remote and uninhabited golden sands of Chrissi Island. You may arrive on the plane or the ferry into Sitia, which is located 61 km to the north east of Ierapetra. Μακρύ Γιαλός or Makri Gialos or Makry Gialos is a beautiful beach located 58 km from Agios Nikolaos and 23 km east of Ierapetra.This is also the name of the Minoan ancient site located just west of the village. 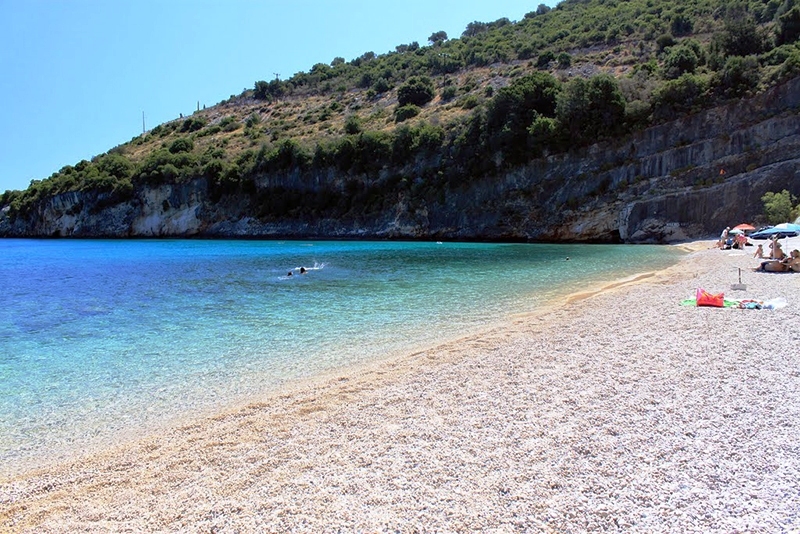 There is a lovely long beach of Analipsi, formed around a wide bay, with fine sand and pebbles. There are numerous coves and little beaches to explore such as Diaskari and Ammoudi Beaches. The area is busy with agriculture, with olives growing on the hillsides and vegetables produces in numerous greenhouses dotted all around, there are many hotels and pensions on the beachfront as well as tavernas and cafes, and all sorts of conveniences such as mini markets and ATMs. 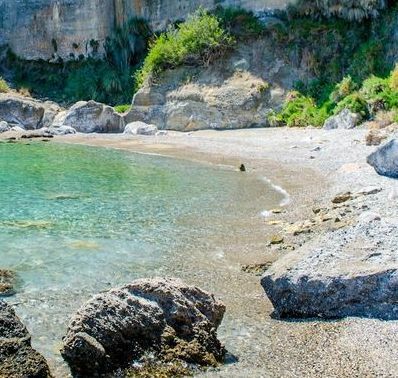 The beach lies at the entrance to Pefki Gorge, which provides good hiking and the inland villages of Agios Stefanos, Pefki and Aori are to be explored on high back roads. The E4 European Walking Path crossed through Pefki Gorge, which means 'pine' and is full of lush green forest. Start the Pefki Gorge walk in the north, as the village of Pefki, and walk 4.5 km downhill and south, ending in Aspros Potamos, 2 km north of Makrigialos. 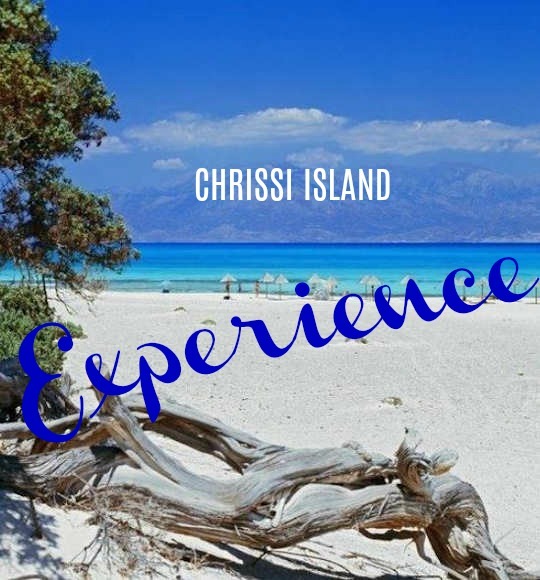 The name Chrissi or Χρυσή means 'golden' and refers to the stunning sand on this uninhabited island south of Crete. This is a small, undeveloped, low-lying island about 7 km by 2 km and only 30 metres high, at its highest point. This stunning island has many coves and may be visited from spring to autumn. Access is by boat. Select from beachside, mountain or town accommodation below. We choose small guesthouses or pensions, family-run small hotels and beautiful locations. 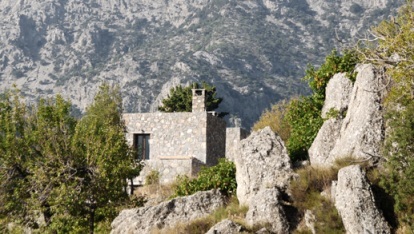 Pezoulia Mountain Retreat is surrounded by the Selekano Forest high in the mountains of Lasithi. Get away from it all and enjoy the fresh mountian air and cozy privacy. The Cretan Villa Hotel is in the centre of Ierapetra town with easy access to the port for a day trip to Chrissi Island. A restored 18th century building with loads of character makes the perfect base for exploring south east Crete. 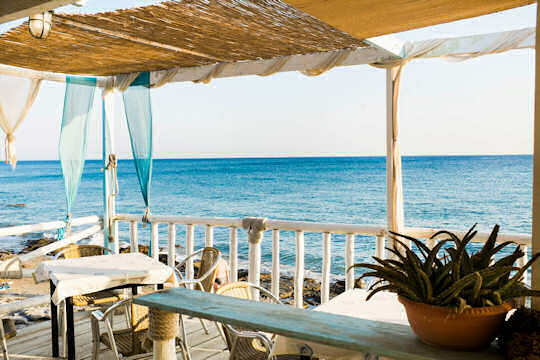 The beachside location of Villa Plori means you can simply stroll from your hotel directly onto the sandy beach of Makrigialos, 26 km east of Ierapetra. This is a budget hotel which is ideal for families. Coriva Beach Hotel and Bungalows on Koutsounari Beach with direct access to the lovely long sand and pebble beach. A peaceful resort with its own large pool, and Pelagos Seaside Restaurant and bar by the beach. Located 9 km east of Ierapetra, this is a quality hotel ideal for romantic holidays. With a day spa, free parking and easy access, this makes a wonderful choice of accommodation in south east Crete. Carob Villa has three private beaches shared only with one other villa. This splendidly secluded home is on 5 acres of gardens. Be surrounded by nature to enjoy a family holiday or romantic getaway. Located on little known coves, not far from Agia Fotia, just 8 km from Ierapetra. 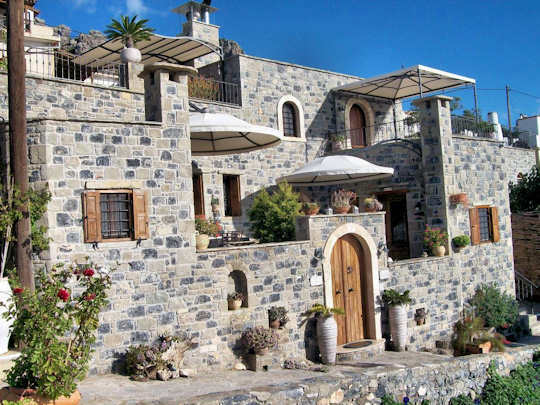 Mayla House is 11 km from Ierapetra in south east Crete, near Ferma. 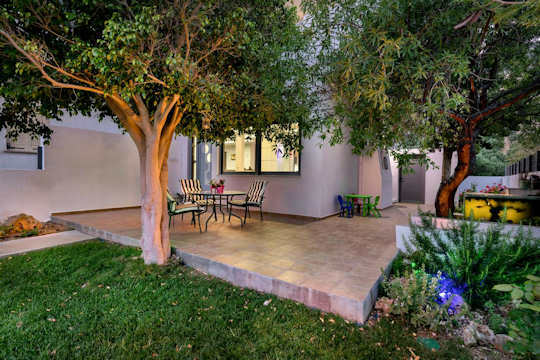 Set a little bit back from the beach, this is a modern stylish home-away-from-home with a relaxing garden setting. 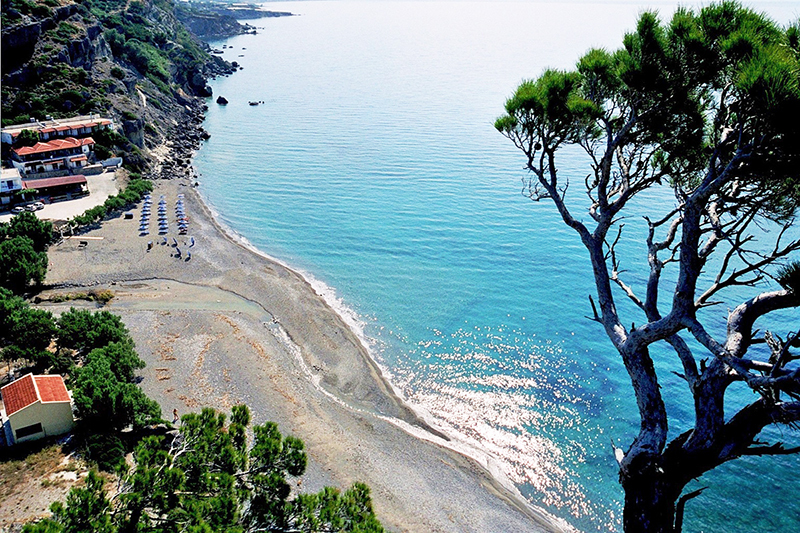 Agia Fotia Beach (pictured above) is made of fine sand and is an excellent choice for swimming. The tall pine trees make it unique, and it is generally a quiet place to visit.